You can have a bespoke printmaking workshop devised for your gallery, arts centre or local interest group. Typically, a workshop consists two-sessions on one day (morning and afternoon), producing ink-on-paper prints using the collagraph method. Collagraphs produce textured impressions in the paper as well as the inked image. In the morning session, participants will glue a wide variety of materials onto pre-prepared a board surface to make printing plates. Materials used can include torn or cut fabric pieces and edgings, string, matchsticks, rubber washers, pieces of card, kitchen foil, dried leaves etc. Participants can bring along a bag of their own materials (see above) to make their plates. Provided the materials are not too thick (no more than 2mm) and not sharp, they will work fine. However, I will also bring along plenty of materials for people to use. 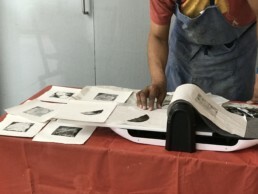 In the afternoon, participants will use a small, mobile printing press to print their plate(s) to see the results! I will work with a representative from your organisation to ensure that your venue has the necessary facilities to host one of my workshops and conduct a full Risk Assessment in accordance with the rules for your venue. Email me with your enquiry and I will get back to you.